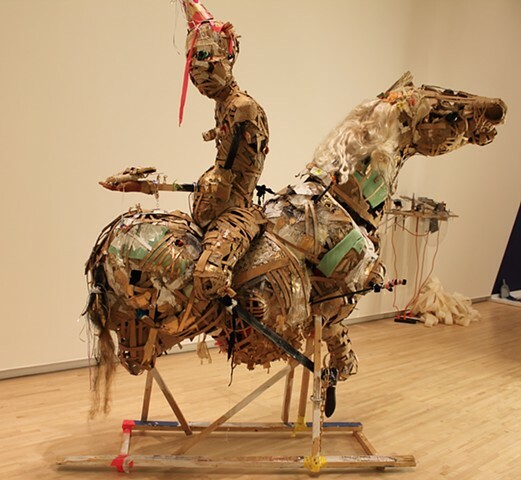 A Hero’s Journey to A Distant Land.. was constructed predominately from salvaged cardboard ¬– a ”poor-man’s” material loaded with social contents. I sparsely decorated the cardboard with found kitsch material such as fake flowers, colored duct tape and metallic spray paint. Using such material, I challenge art historical models of monument construction. The embellishments bestow a sophisticated visual coherence in the material, whereby viewers are invited to gain a new appreciation for the material and its contents. Through repurposing, this work achieves an alchemical stature that challenges the notion of trash and treasure. My intention in doing this is to awaken the human consciousness to the realities of society as it relates to human suffering that we ignore. The visual narrative in this work is informed by the notion of the “celebration” as it relates to the return of the ex-convict to society. I am interested in the idea of time served in prison as being less of a reform period but a rite of passage and/or an initiation of sorts within many ghettos. This work represents struggle, conflict and celebration. I borrow from the Greek mythology, the Return of Hephaestus, and the historic Spanish novel and play, Don Quijote as I portray the return of a broken man. I use the horse as metaphor for power and authority and the backwards rider as the rejection of such structures. The work also addresses the role of sexuality in regard to inside and outside of prison as the rider is littered with wounds that are plugged with tampons. He is also impregnated. Interior and exterior extremities are exposed, housing objects such as faux jewelry, toys, and beads. The exposed areas reference vulnerability faced both in the institution and in society. The overall structure also becomes a prison of sorts as it incases these objects similarly to how prisoners are stored in cells.